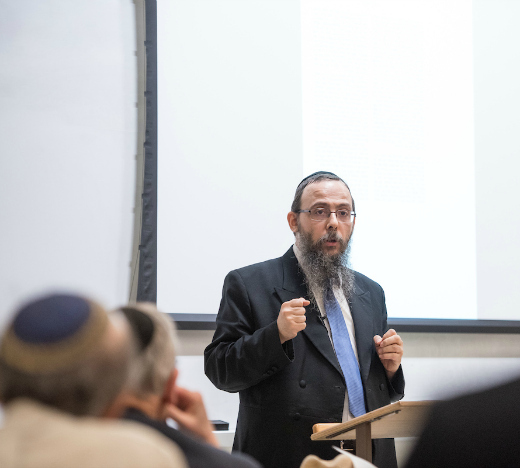 On May 16, the Bernard Revel School of Jewish Studies presented a lecture titled “The Forged Yerushalmi” by historian Rabbi Boruch Oberlander, head of the Budapest Orthodox Beis Din and a long-time leader in the Hungarian Jewish community. The lecture was part of a series of talks from international scholars that Revel is hosting in celebration of the school’s 80th anniversary. 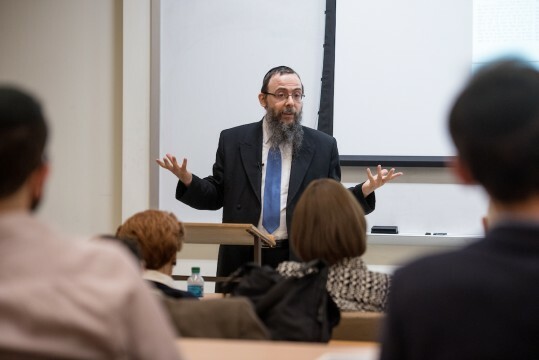 In a lecture on the history of “The Forged Yerushalmi,” Boruch Oberlander told a fascinating story about the history and personalities involved when the supposedly lost tractates of Seder Kodashim suddenly appeared in Hungary in 1907, courtesy of a forger by the name of Shlomo Yehuda Algazi-Friedlaender. The discussion revolved around one of the most famous recent forgeries of a sacred Judaic text. In January 1907, Shlomo Yehuda Algazi-Friedländer published in Hungary what he claimed were the long-lost tractates of Seder Kodashim of the Jerusalem Talmud, garnering praise in rabbinic circles for bringing this material to light. However, according to Rabbi Oberlander, just six months later, three articles had appeared that dissected the document and declared it a forgery. Rabbi Oberlander, a scholar who has written previously on the history of Jewish forgeries, shared evidence from Talmudic research and forensic science (for instance, proofs that the paper on which the document was written had been artificially aged) to show how Friedländer’s manuscript had been thoroughly discredited by 1913. Rabbi Oberlander demonstrated how factors such as the state of the relations between the Jews in Hungary and places like Poland and Galicia and the process of buying, selling and distributing Jewish documents at the time impacted Friedlander’s ability to pass the forgery off as genuine. Stereotypes about national culture and willful self-deception also played a role in making it possible for a person of questionable Talmudic skills but a gift for trickery to succeed in convincing others that he had indeed found the missing tractates. In addition to writing about Jewish forgeries, Rabbi Oberlander has also published works on the application of halacha to contemporary society and Jewish liturgy and customs. The event was supported by a grant in memory of Mr. Zoltan Erenyi z”l.